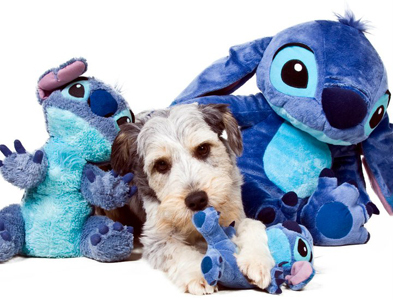 Stitch is quite lucky to be considered an honorary member of the Purple Posse, He doesnt even wear Purple! But because he is such a little star and as I will be pinching him for the odd show when Mum is unable to attend, he will still be considered a Posse member even though he dresses in Blue. Stitch caught our eye on the Many Tears website at just 7 weeks old, but with Mum pending an operation, and Dad unlikely to let another dog in the house it just didn’t seem like the right time. Then he came up on the site again at 15 weeks old his adopters had returned him for an unprovoked attack… from a puppy?…Mmm…. anyway, their loss was our gain – I encouraged Mum to pursue what she wanted, Dad was kind enough to agree, although he didnt realise that it would entail me whisking Mum off to Wales the day after she was released from Hospital with the entire Skinner Pack in tow for our meet and greet. Stitch got on well with all of our dogs, Mum was smitten and he came home with us that day. It all happened so quickly. At 16 weeks old I took him to Dashin Dogs to experience his first show he was an absolute terror, screaming as soon as he saw agility I WANNA DO THAT!, stealing food from the tent, destroying his crate, I was all too happy to give him back to Mum at the end of the week. Stitch has the brains of a collie, but the attitude of a terrier which makes him an evil genius, but he is Mum’s ‘Little Angel’ and an absolute pleasure to train and work with. Mum put a lot of time and hard work into Stitch, getting used to running a medium dog and adapting her handling style made for some great training. Then at his first show, in his first run, Stitch won the class by an impressive 15 seconds taking him up to Grade 4 The only person who seemed surprised was Mum! In 2012 following a botched operation my Mum had to take a break from Agility and I took Stitch over, it was now my turn to get used to running a Medium dog and what a Medium Dog! Running Stitch is certainly the most fun I have EVER had in Agility, the adrenaline, the speed, the noise, some seriously good times! In our first ever Champ competition he got me to the Final and it was only a handling error by myself near the end which cost us the Final. But all good things must come to an end and with my parent’s decision to move to France I had to bid Stitch a fond ‘au revoir’. My Mum’s health is improving so Stitch is able to continue to do Agility in France with her but my goodness do I miss having that terrier-ist around. I hope one day the right scruffy rescue will turn up at the right (or even wrong) time for me.